University of California Television (UCTV) recently put together a four-part video series on one of my dissertation committee members, Prof. Shuji Nakamura, and his role in GaN-based light emitting diode (LED) research. It's a great overview of the history of GaN and the impact it's had on energy efficient lighting applications. You can watch them online here. The videos include several shots of our labs at the Solid State Lighting and Energy Center at UC Santa Barbara. Part 2 of the series talks about Nakamura's early life and his persistant motivation trying to create the worlds first blue LED on GaN. It also includes a shot of me at the 7 minute mark, just as the narrator explains how difficult it was to work on this semiconductor material. Perhaps needless to say, these shots were totally staged. Most of my friends and family have no idea what I do for a living. Although the entire video series explains my research and the research of my group in general terms very well, this brief glimpse of my lab isn't particularly enlightening. Obviously what looks good on film is often not true to life. In a small manner of communicating my science to the masses, I'd like to point out what parts of these few seconds of me at work is actually authentic. This is the actual lab and test set-up I used to test laser diodes for my dissertation work. The microscope I'm looking through is the one we use to align the needle probes onto the laser diode devices, which we need to do because they are so tiny. 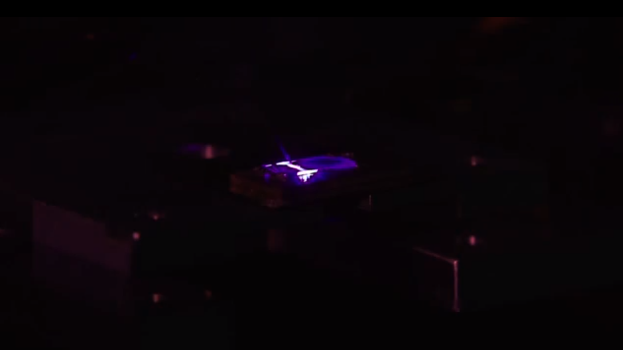 During filming, I had an actual laser diode probed and turned on via a pulsed wave generator, one of the tools located on the shadowy lab bench, at eye-level, which is connected to the probe station via a nest of coax cables. In the beginning of the shot in Part 2, I'm actually adjusting the seconds per division on the digital oscilloscope, which is totally unnecessary to adjust since our measurements are automatically calibrated and measured via a Labview program from a nearby PC. However, at the time I had things in manual mode, and the scope was actually displaying the light output, current and voltage across the device I had probed. I displayed a blue laser beam pattern on the computer monitor in the background. This is an actual image from one of my laser diodes, just not the one currently probed. In the close-up of the actual edge-emitting laser diode I was "testing," I had the current and duty-cycle turned way down, to make the light very dim. Otherwise it would look too bright for the camera. With the current that low, it wasn't even "lasing," just a faintly glowing stripe of light. The gel lights. Unfortunately ubiquitous in any fictionalized science lab. 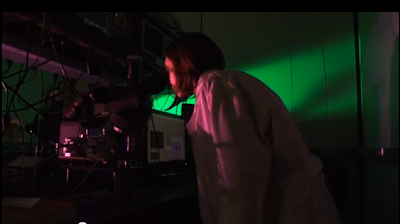 Our lab has standard fluorescent lighting, but obviously that doesn't look dramatic enough. I laughed when the film crew started setting up the green gels, which we joked was the "official color of science." The lab coat. I normally don't wear one for laser testing. I actually wore a nice collared shirt and sweater the day we filmed this, but the camera guy really wanted me to wear a lab coat, so this is a random one I grabbed off the rack in the hallway that was WAY TOO BIG. The video doesn't show all the other things I spend 95% of my time doing, such as: MOCVD crystal growth, cleanroom processing, materials characterization, plotting data, making powerpoint slides, and telling first year grad students what to do (haha). In the end, I think my role in the video was mostly authentic and I'm happy with the way it turned out. I was glad to participate in the exercise, not only to show off my lazerz but also because I knew there wouldn't be very many females in the video otherwise. Which is the subject of a whole other post. Ladies. I wrote about laser diodes, so go read that post if you want to know more. Part 1 - The LED to improve education in the developing world. Part 4 - Research into the future of lighting and energy use.